Nautilus are tmembers of the Cephalopods. Their scientific name is Nautilidae. There are six liivng species which have survived relatively unchanged for millions of years and are often considered "living fossils". 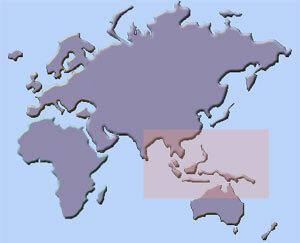 They are found on the deep slopes of coral reefs. Nautiluses usually inhabit depths of about 300 metres, rising to around 100 metres at night to feed, mate and to lay eggs. The Chambered Nautilus (Nautilus pompilius) is the best known species of nautilus. Nautiluses are slow-moving predators that feed mainly on shrimp, small fish and crustaceans, which are captured using their tentacles. They only need to eat once a month because they use very little energy to swim. To swim the nautilus draws water into and out of the shell with its funnel, this produces jet propulsion. Unlike the other Cephalopods, they have an external shell which provides protection and spaces that can be filled with air to adjust their buoyancy. They can withdraw completely into their shells and close the opening with a leathery hood formed from two specially folded tentacles. Unlike most cephalopods, they do not have good vision although their eye structure is highly developed. Instead of a lens they have a simple "pinhole" eye. Instead they use two special tentacles for the sense of smell to hunt and find mates. They have up to ninety tentacles many more than other cephalopods. These tentacles are arranged into two circles, they have no suckers and can be pulled back into their shell. 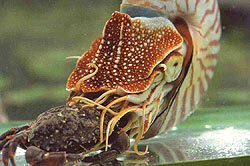 Most Nautilus species grow up to 20 cm in length. They may live for over 20 years, which is very long for a cephalopod. A mature female (aged 5 to 10 years) will lay around twelve eggs on rocks after being fertilised by a male's four special tentacles used to transfer sperm into the female's mantle. The eggs take eight to twelve months to develop until the 3 cm juveniles hatch. Many Nautiluses have been killed due to the beauty of their shell and they are protected in some countries.